The burger chain U.S. President Barack Obama helped make famous, when he stopped by on a whim shortly after taking office, is rumoured to be setting up shop in Winnipeg. Five Guys already has one successful location in Manitoba, situated in Brandon’s Shoppers Mall (right). The restaurant has received rave reviews on eBrandon.ca since opening up earlier this year. 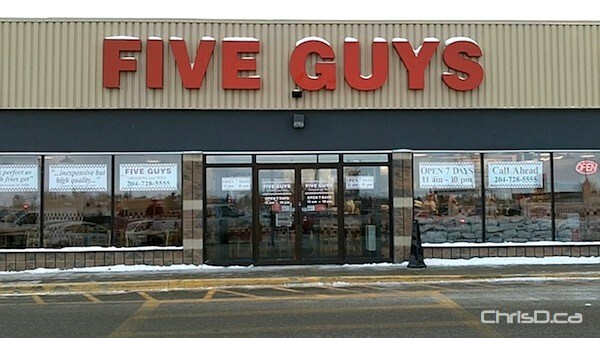 Although the restaurant chain wouldn’t officially confirm the news, we’ve learned Five Guys is set to open two, or possibly three locations in Winnipeg. The first is said to be on Kenaston Boulevard near Rona, with another on Portage Avenue. A third location will likely come up in Kildonan Crossing, between Lagimodiere Boulevard and Panet Road. The manager of the Brandon restaurant says the chain will open up its first Winnipeg location sometime in late February. Five Guys is known for its large portions, and sometimes intimidating ordering process with all the options provided. Therefore, it wouldn’t hurt to familiarize yourself with their menu to prepare for February. Online reviews from American customers suggest Five Guys trumps every other fast food restaurant, including the famous In-N-Out Burger south of the border. This may be a sign of good things to come. Although, we’re still waiting on a White Castle.